Developed by HWKN (Marc Kushner and Matthias Hollwich) is an architectural experiment that pushes the boundaries of what architecture can do in an urban environment. 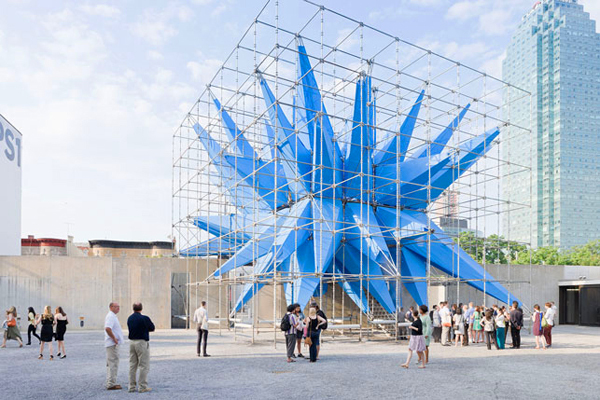 The installation, known as Wendy, was on show for a temporary installation for the 2012 Young Architects Program at MoMA PS1. The intention of Wendy was to change the public’s notion of what architecture should be. As explained by HWKN, “Wendy does not play the typical architecture game of ecological apology – instead she is pro-active.” The structures ecological function will actually clean the air. So, what actually creates Wendy? Within the 56′ by 56′ by 46′ volume is a structure created from repurposed scaffolding. This maximizes the surface area for which the thousands of yards of fabric are stretched. The fabric itself is a bright blue nylon. The fabric is treated with titania nanoparticle spray, which neutralizes airborne pollutants. When hit by the sun, nitrogen is neutralized, NO2 is broken down. It then drops down to the earth in a neutralized state, leaving the air clean. Wendy’s short stay cleaned the air an equivalent to taking 260 cars off the road. Wendy is more than a stationary piece of architecture. She is interactive on a sensory level. Her spikey fabric arms shoot out blasts of cool air, music, and water. She exudes personality, and she positively impacts the environment. The growth of nanotechnology over the past several years has allowed for the development of functional objects. The success that has been experienced with Wendy has shown that the more fabric that was incorporated into the architecture with the Nano treatment, the more clean air that was left behind. Wendy is a great example of how aesthetic design incorporating fabric and nanotechnology can remove impurities from our air, leaving our cities cleaner and better.